Sometimes I read foodie articles and marvel at my own lack of creativity or insight. I read an article recently that revolutionized my oatmeal making, and I kept thinking, “why didn’t this occur to me?”. The article asked why, when we toast rice and other grains prior to cooking, we don’t ever toast our oats before making oatmeal. Toasting brings out wonderful flavor in nuts and grains–what would risotto be if we didn’t toast the arborio rice prior to adding the stock? I know right? So since we have had three snow days in a row (rare here in North Carolina), I decided a lazy morning was a good time to experiment with this technique. I don’t think I will ever make oatmeal another way again. Oh. My. Goodness. Toasting the steel cut oats gives the oatmeal an amazing depth of flavor and a wonderful nuttiness. And since snow days are mornings where we go a little over the top with our breakfast, I added some cinnamon and almond butter to the oatmeal for a protein-packed, super healthy start to the day. This is crazy delicious. I want to eat this all the time. So go ahead, toast your oats! Let me know what you think. I think you will never look at oatmeal the same way again! In a saucepan, heat the butter over medium heat until melted and just foamy. Add the oats and stir well. Continue to cook the oats, stirring frequently, for about 5 minutes. The oats should darken slightly and give off a wonderful, nutty aroma. Add the water and continue cooking and stirring for about 30 minutes or until the oatmeal is to your desired consistency (I like mine very thick, so I cooked it for 40 minutes). 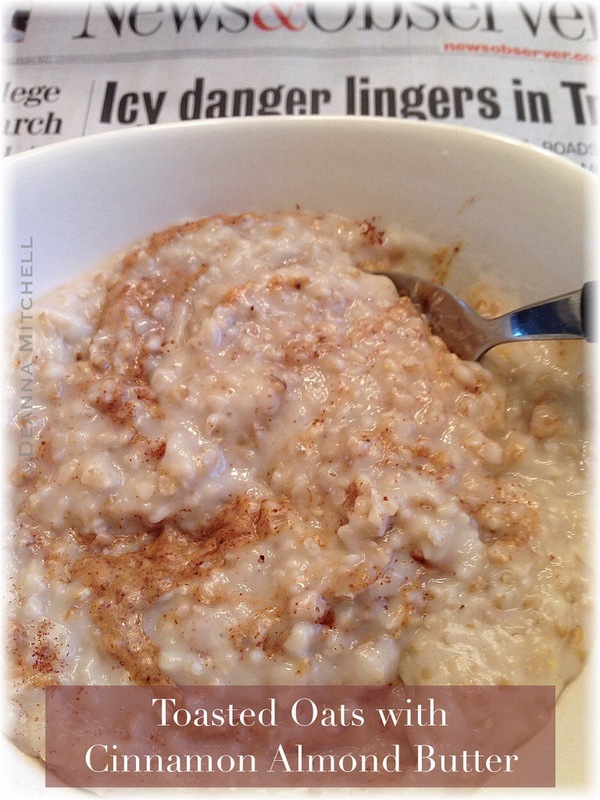 Plate the oatmeal in serving bowls or mugs. Add one tablespoon of almond butter, a little pinch of salt, and a generous sprinkling of cinnamon. NOTE: You can freeze the oatmeal in greased muffin tins, giving you servings ready to heat in the morning. Also, this oatmeal will keep for up to 5 days in the refrigerator.